The mid-ocean ridges and the new oceanic lithosphere that they create are the principal pathway for energy and mass exchange and physical/chemical interactions between the earth’s interior, the hydrosphere, and the biosphere. 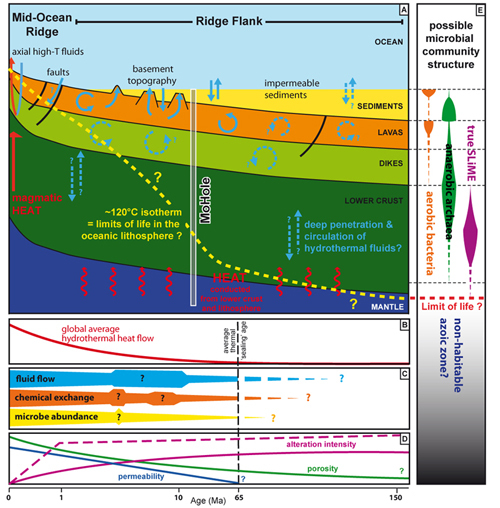 Bio-geochemical reactions between the oceans and oceanic crust occur through out its lifetime, and hence the ocean lithosphere records the inventory of global thermal, chemical and biological exchanges. 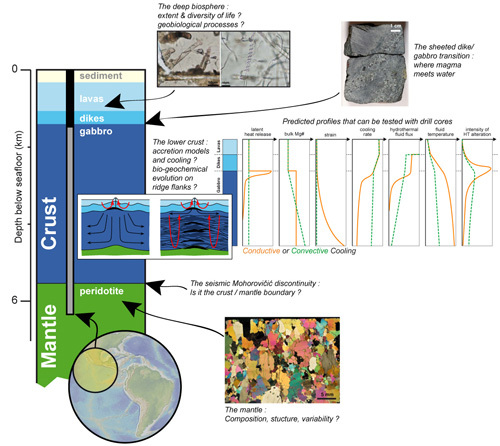 Drilling an ultra-deep hole in an intact portion of oceanic lithosphere, through the crust to the Mohorovičić discontinuity, and into the uppermost mantle is a long-standing goal of scientific ocean drilling ; it remains critical to answer many fundamental questions about the dynamics of the Earth and global elemental cycles. The 2010 MoHole workshop followed several recent scientific planning meetings on scientific drilling in the ocean lithosphere, in particular the Mission Moho workshop in 2006, and the Melting, Magma, Fluids and Life workshop in 2009. These meetings have clearly articulated that a deep hole through a complete section of fast-spread ocean crust is a renewed priority for the ocean lithosphere community and imperative to answer a wide range of fundamental science questions. The scientific rationale for drilling a MoHole in fast-spread crust is developed in the reports (available online) of these workshops, and in the Mission Moho proposal that was submitted in 2007 to IODP. [A] Schematic architecture of a mid-ocean ridge flank (not to scale), illustrating parameters that may influence the intensity and style of hydrothermal circulation through the ridge flanks, such as faults, seamounts, basement topography, and impermeable sediments, which isolate the crust from the oceans. Arrows indicate heat (red) and fluid (blue) flow. [B] The calculated global hydrothermal heat flow anomaly decreases to zero, on average, by 65 Ma. [C] The effects of parameters such as basement topography and sediment thickness on the intensity and relative cessations of fluid flow, chemical exchange, and microbial activity remain undetermined. [D] Evolution of porosity, permeability, and alteration intensity with age. [E] Hypothetical change in microbial community structure with the depth limit of life increases with crustal age. Workshop participants began developping a roadmap for the technology development and the project implementation plan that are necessary to achieve our deep drilling objectives. Participants also identify 3 potential regions for siting the MoHole in the Pacific (i.e., in fast-spread crust), where the scientific community will focus geophysical site survey efforts over the next few years. Selecting drilling sites is essential to clearly identify the range of water depths, drilling target depths and temperatures that we anticipate, and better constrain the technological options that should be developed and implemented to drill and log the MoHole. These discussions were held jointly between ocean lithosphere specialists, marine geophysicists, and drilling engineers, with the aim of identifying the best possible sites in fast-spread crust given our current geological, geophysical and technological knowledge and expertise. 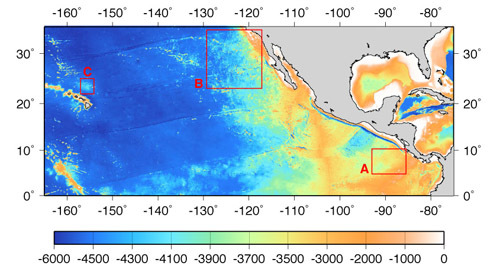 Bathymetric map showing the three selected areas for large-scale MoHole site survey : [A] Cocos plate region, [B] off Southern/Baja California region, [C] off Hawaii region.